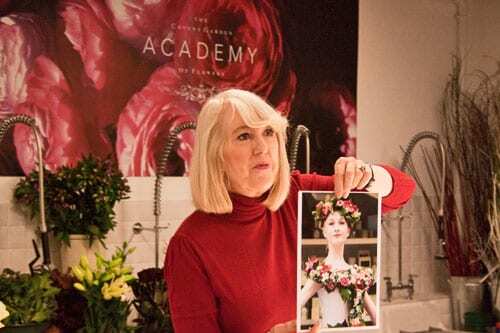 This month, I attended a fabulous two day Wedding Flowers course at the Covent Garden Academy of Flowers in London. 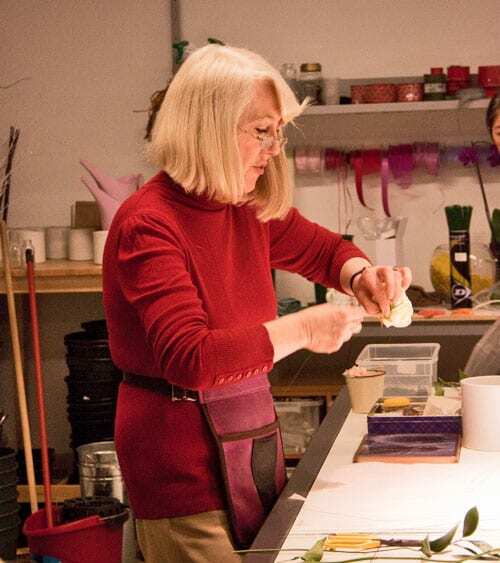 You may remember that I attended their Summer Flowers course back in July? And above is the bridal bouquet I created following demonstrations by the Principal, Gillian Wheeler and her colleague, Madeleine. On the course, quite a few of the ladies attending were going to be doing wedding flowers for family and friends, and wanted to learn the techniques and pick up tips…of which there were lots! 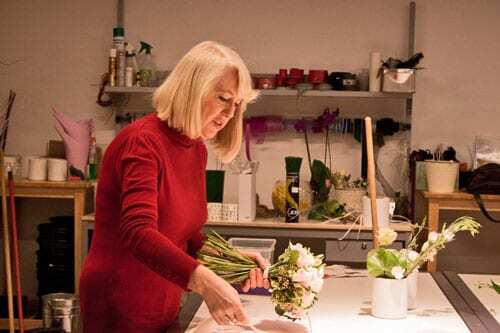 Gillian explained that when planning wedding flowers, it’s advisable to buy the blooms two to three days in advance, so that they have a chance to open and look their best for the special day. Some flowers, like lilies and amaryllis may need to be bought even earlier. 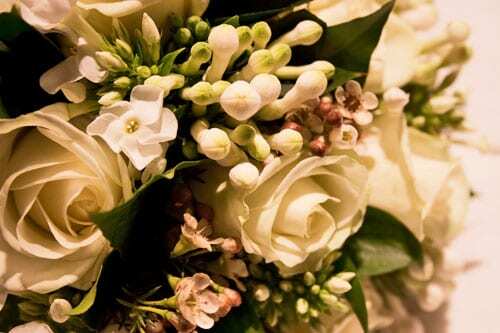 Gillian also suggested that it’s a good idea to create a mood board for the wedding flowers which you’re planning on creating, so that you can make sure you know exactly what colour and style of flowers the bride has her heart set on. We started the day off with conditioning. First, we stripped the flowers of the majority of their foliage, cut the stems at a slant and placed them in clean water. Then Gillian demonstrated how to wire ivy leaves for the bouquet and showed us some photos of amazing designs she had created for The Royal Ballet School using the technique. 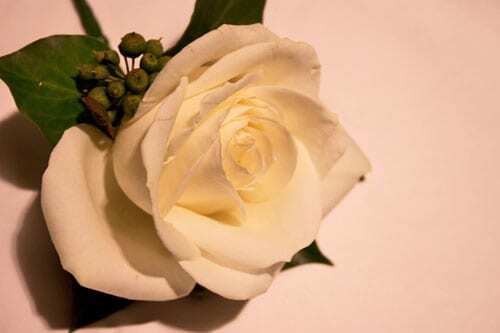 With regards to roses that we were going to use in our bouquets, she explained that some people like to remove the outer petals, which are called guard petals. However, others prefer to leave them on for a more natural look. Once we had everything prepared for our bouquet, Madeleine showed us how to make the hand-tied arrangement. 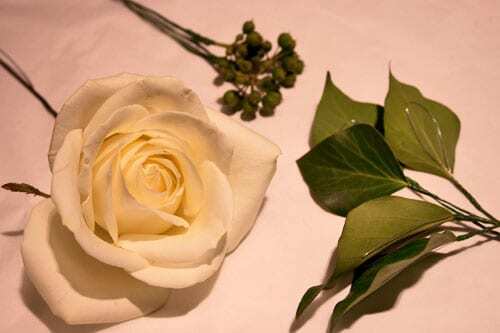 It was then our turn and I used white roses, bouvardia, phlox, waxflower, ivy, ruscus and a collar of galax leaves. One great tip is to look at your bouquet in a mirror when you’ve finished it…it’s amazing how seeing it in a reflection helps you notice where you need an extra flower or piece of foliage. 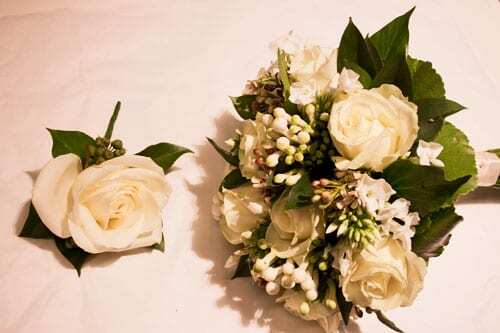 Once we’d completed our designs, Gillian showed us how to add the ribbon to the bridal bouquet, together with pearl-headed pins. 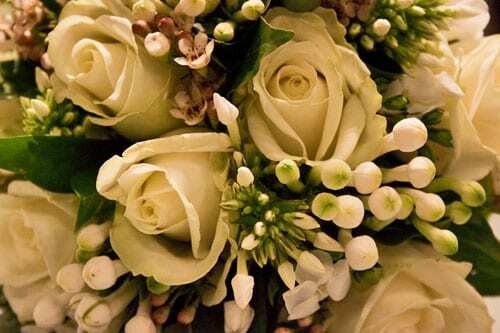 She said it’s a good idea when delivering the bouquet to advise the bride to take it out of water half an hour to an hour before she leaves the house, so that the water does not drip on her dress. After lunch, we were to make a buttonhole and Gillian demonstrated the various techniques that we needed to know to be able to wire the different types of flowers and foliage. We started off with the rose and she showed us how to make small sepal pins and attach them to the sepals at the base of the flower. After cutting off the stem, we pushed a thick wire up into the base of the rose and a horizontal wire to secure it. Then to keep in the moisture, we bound thin green plastic stem binding tape, called parafilm or gutter tape, around the base of the stem and wires. After the rose, we then wired and taped ivy berries and leaves, with the main aim being to make the wired components as light as possible. 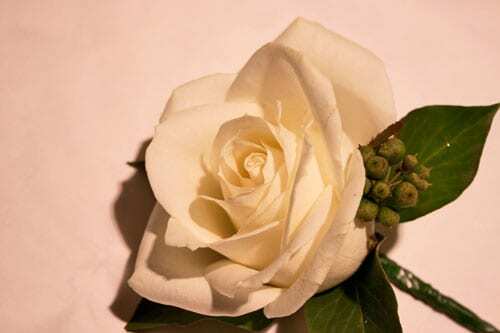 And here’s the completed buttonhole. 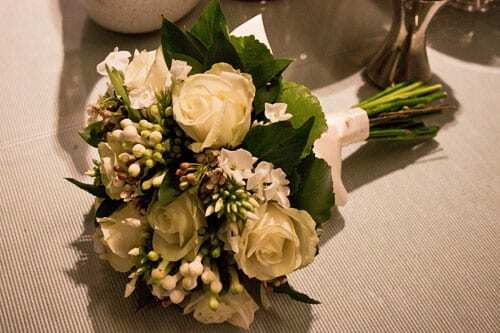 Before we left for the evening, with our packaged-up designs, Gillian showed us some bridal bouquets from a beautiful book called ‘To Have and to Hold: Magical Wedding Bouquets’ by David Stark and Avi Adler. We all had such a wonderful day and whilst we were there, the course was being photographed for Wedding Flowers magazine, so I’ll let you know when it appears. Thank you Mimi. I had a wonderful time…great company and surrounded by flowers :-). This is fascinating to me, Rona. And fantastic that you are able to attend these courses. 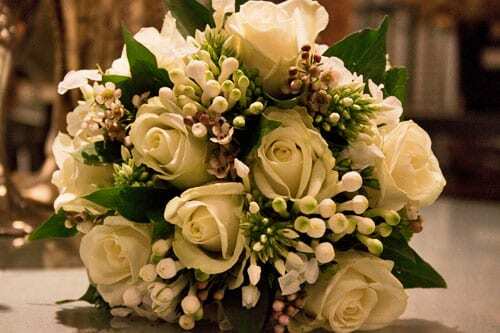 Thank you so much for sharing the details and your bouquet is BEAUTIFUL! Thank you Georgianna for popping by and your lovely comment :-).